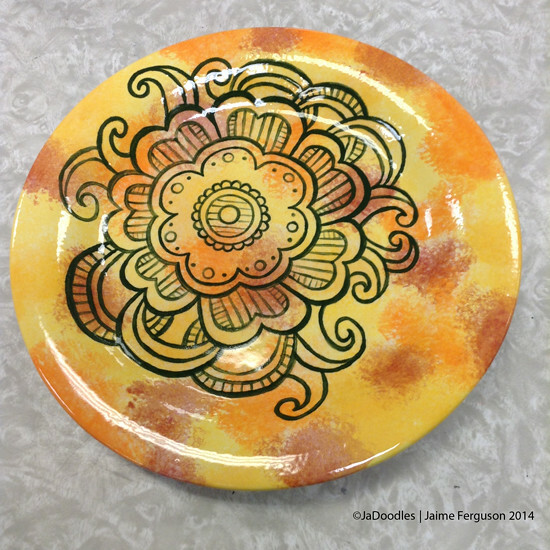 At the end of last year, I was asked to create a sample plate for the art studio I frequent that has a pottery painting section for their customers. 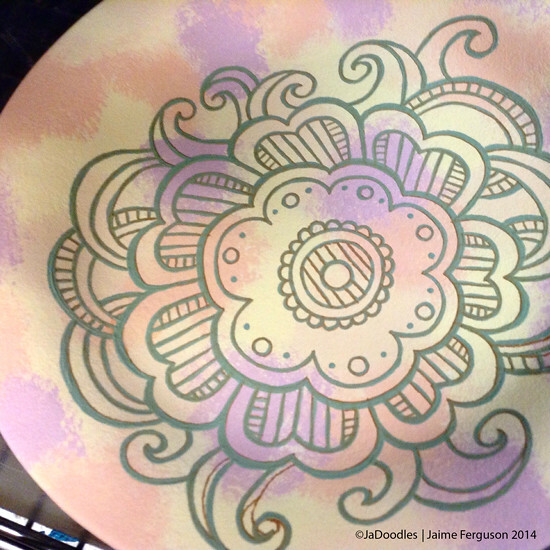 Of course, I was thrilled to have a chance to paint more pottery since it is now my obsession! Choosing fall like colors, I sponged about 4 different colors onto the plate (which is a really fast way to get your glaze on the bisque). Of course, I sponged about three layers of color for each spot and waited until it was completely dry before I took a water soluble marker to draw out my doodle design I had in mind. Once it is placed in the kiln, the ink from the marker will burn off and you won’t see any trace of the lines. If you make a mistake in your line work (which you see below), it will not affect your final piece. Didn’t want to get too carried away with the doodle since customers may try to mimic the plate. I wanted to try out one of the dark green glazes instead of using black on top of the autumn colors, but I was a little worried that it wouldn’t be strong enough to go over top of the other glazes. Just in case, I went over the lines three times to make them as dark as possible. Above is what your pottery will look like after you have covered it in glaze but you haven’t fired it. The colors will always be more on the pastel side at the beginning. Once they have been placed in the kiln the colors will become more vibrant. It turned out beautifully! I loved how textured the background ended up being because of using a natural sponge to place the color onto the plate. In the final image, the dark green looks black, but it did turn out well. It has been at the studio for several months now, and it has been cool to pop into the studio and see it hanging on the wall. Thank you so much, Lexi! 🙂 These are so much fun for me!